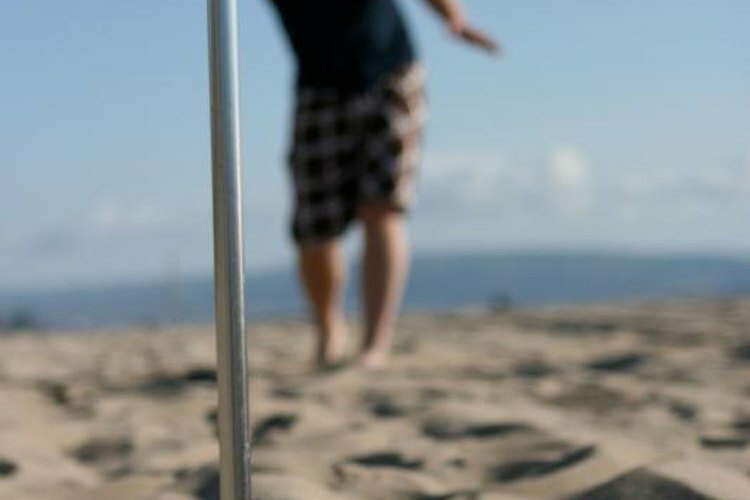 Horseshoes are easily set up at an uncrowded beach. It was more than likely farriers or blacksmiths who first inspired people to take delight at tossing large horseshoes at a pole. From friendly games at family gatherings to fierce competition in world tournaments, the sport of horseshoes is one that people of any age or athletic ability can enjoy. With a little aim and knowledge of a few flexible rules, you might find yourself hooked on the game. If you're just playing for fun in your backyard, it's okay to set up the horseshoe stakes on grass. However, if you're practicing constantly, you'll want to reposition the stakes every day to avoid causing wear spots in your lawn. If possible, position your stake on sand, clay or another soft substrate easily leveled between turns. Pound in stakes 40 feet apart, and draw a foul line 37 feet and 27 feet from each post. A backstop -- such as a length of railroad tie -- prevents a bouncing shoe from rolling away and injuring a bystander. You'll find horseshoe pits with backstops and side rails in parks and other public facilities. You can play the game with two or four people and four horseshoes. The horseshoes have different colors on their ends, and each team selects a color. The first person to throw steps up to the appropriate foul line and pitches both of his horseshoes, one after another. If playing as a team, the other player throws from the opposite end when it is his turn. Women, older players and children can pitch their horseshoe from the 27-foot mark, but men generally pitch from the 37-foot mark. Toss the horseshoe at the opposite stake in an underhand pitch, attempting to get it around the stake or as close to it as possible. A horseshoe that fully encircles the stake is a "ringer" and is worth the maximum score of three points. Any horseshoe landing within 6 inches of the stake -- about the width of the horseshoe -- is worth one point. "Leaners" -- shoes that touch the pole without encircling them or lean up against the pole -- are worth one point in official tournament play. In non-tournament play, you can choose to count leaners as two points. Players continue pitching shoes until one player or team reaches an agreed-upon score -- usually 40 points in tournament play. Novices may prefer to play to 21 or even 11, depending on attention span and ability. There are two ways to score the game of horseshoes. In count-all scoring, both teams receive full credit for any points they score. Teams may alternate pitching first in this type of play to ensure each gets an equal number of first pitches. In cancellation scoring, the points from a ringer gets canceled out if the opposite team throws a ringer that lands on top. The team scoring highest throws the first pitch, putting it at risk of having a ringer canceled out.